Cheese and crackers are a traditional go-to for cocktail hour, a quick and simple game snack or even a light dinner on a harried night. But while the buttery flavor and delicate crunch of Ritz crackers make them as versatile as they are delicious, they don't provide much in the way of vitamins, minerals and fiber. Ritz crackers offer very little nutrition for their calorie count, but are fine for an occasional snack if you eat them in small quantities. 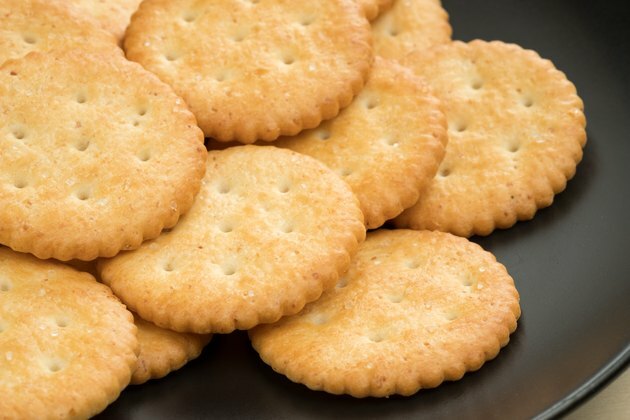 Ritz crackers, like most simple crisp breads, are made up of flour, sugar, salt, oil and flavorings. According to the company's web page, RitzCrackers.com, one serving of original Ritz crackers — or about five crackers, as stated on the front of the box — contains 80 calories, 40 of which are fat. Ritz Crackers are fairly low in sodium, with one serving containing about 4 percent of your total daily recommended intake, but they provide no vitamins or minerals. And the fat these crackers contain is problematic, because it's mainly trans fat. The nutrition labels on both the website and the front of the box claim that original Ritz crackers contain no trans fats, but this is misleading. The ingredients list includes partially hydrogenated cottonseed oil, which is absolutely a trans fat. But when each serving of a product contains fewer than 0.5 gram of trans fats, the manufacturer is allowed to claim the number as zero, reports Time. According to the health experts at the University of California, Davis, trans fats have several negative effects on your body. First, they raise the level of low-density lipoproteins, or LDLs, in your bloodstream. LDLs can clog your arteries, contributing to high blood pressure and increasing your risk of heart attack, stroke and certain types of cancers. Trans fats also lower your levels of high-density lipoproteins, or HDLs, whose job it is to scour the LDLs from your blood. So it's not just the calories in saltine crackers or Ritz crackers that you have to watch; it's also the actual ingredients used to make them that are important. Read more: Why is Hydrogenated Oil Bad For You? High-fructose corn syrup became popular as an industrial sweetener in the 1970s because it's appreciably cheaper than granulated table sugar. High fructose corn syrup is made from cornstarch, and according to the Mayo Clinic, there's not enough evidence yet to say for certain whether it's better or worse for you than sugar. What's certain is that a diet high in empty calories and processed sugar raises your risk of obesity, which can lead to Type 2 diabetes and high blood pressure and increase your risk of heart attack, stroke and some kinds of cancer. Carbohydrates provide your body with its main source of energy, explain the experts at Washington State University, as well as being necessary to fuel your brain. But not all carbohydrates are the same. Simple carbohydrates, such as those in starches and sugar, break down very quickly in your body. This causes the need for insulin to be released to vacuum up all of the extra sugar. When your blood sugar levels then drop, it can cause your brain to signal hunger. This constant fluctuation is unhealthy and can lead to long-term problems such as Type 2 diabetes. Complex carbohydrates, such as those found in whole grains, offer not only fuel for your body and brain, but they contain a fair amount of fiber. Fiber is important for healthy elimination, and it also helps slow down the absorption of sugar and decreases the need for extra insulin to be released. So, while Ritz crackers are delicious, you're better off with higher-calorie Triscuit, because of the added fiber these crackers contain. Mayo Clinic: What Is High-Fructose Corn Syrup? What Are the Health Concerns?